This is the stable version, checked on 14 March 2019. 1 pending change awaits review. Waking Titan was an ARG which led towards the Atlas Rises and NEXT updates for No Man's Sky. Waking Titan (also known as Project WT) is an official ARG (alternate reality game) for No Man's Sky that involves a multitude of websites, phone numbers, and radio stations scattered across the world. The ARG is produced by veteran puppet masters Alice & Smith, and features NPCs, actors, and live events. Relating to the canonical origin of No Man's Sky: The ARG's story revolves around the inception and aftermath of a metaphysical experiment conducted by The Atlas Foundation, with the help of their family of innovative businesses. Wherein they used their collective expertise to invent an A.I that is capable of accurately simulating the future, with a complexity adequate to transcend reality's available resources. Thus causing detectable anomalies within our universe that can be used to determine if it is simulated. Phase 1 Phase 1 of Waking Titan lasted from 2017-05-28 to 2017-07-08. Phase 2 Phase 2 of Waking Titan lasted from 2017-07-21 to 2017-08-05. Phase 3 Phase 3 of Waking Titan lasted from 2017-08-05 to 2017-08-07. Phase 4 Phase 4 of Waking Titan lasted from 2017-12-28 to 2018-06-01. Phase 5 Phase 5 of Waking Titan lasted from 2018-06-01 to 2018-07-20. 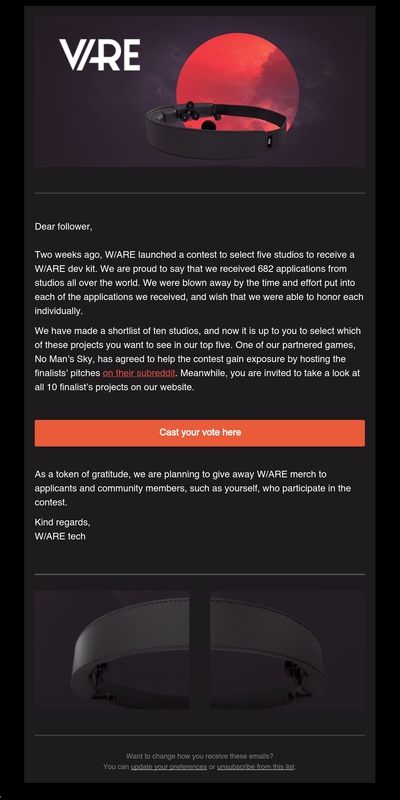 Phase 6 Phase 6 of Waking Titan was on 2018-07-20. Note: This is a summary page. For more in-depth descriptions of each phase, including detailed descriptions of puzzle solutions, check the Phase 1, Phase 2, Phase 3, Phase 4, Phase 5, and Phase 6 pages. 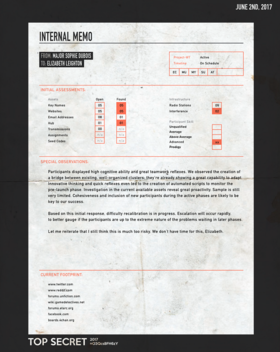 Throughout the ARG, in-game characters have communicated with each other via "internal memos". 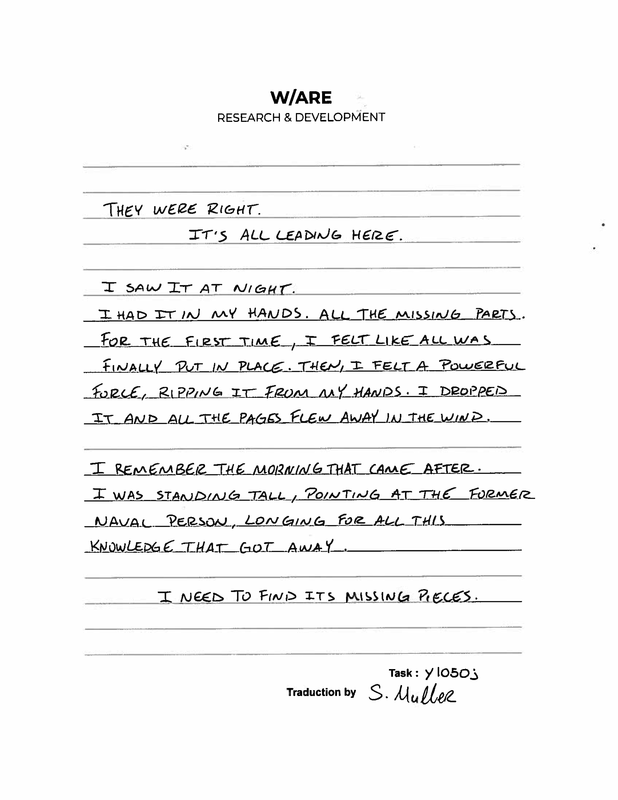 Over time, these memos were discovered by ARG players, in the form of PDF files. 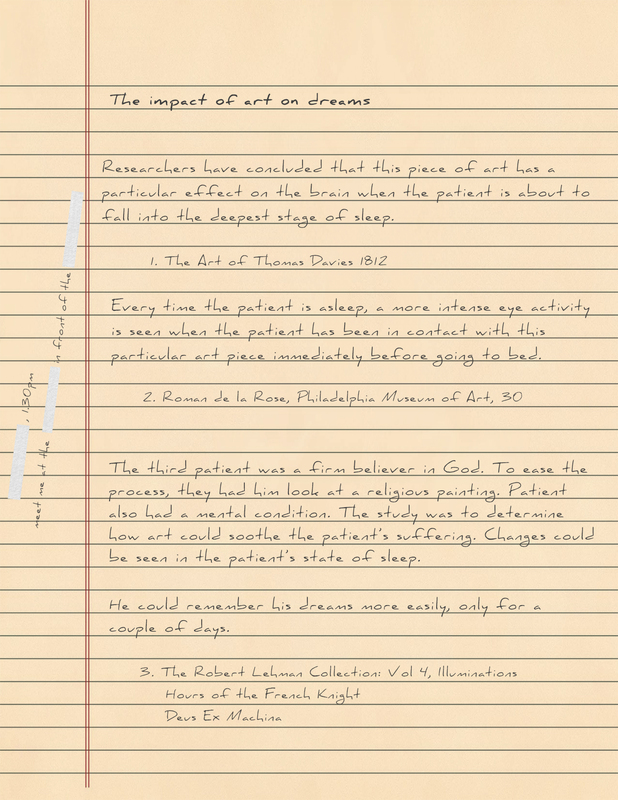 These memos provided lore content and puzzle content, and are highly recommended reading for new players! Navigating through the following subpages is recommended for newcomers wanting to get a grasp of Waking Titan's rapidly expanding story. Characters and Entities Includes a summary of each character, company, and relating experiments and their importance in the Waking Titan story. Company Archives An archive of official company details. The various newsletters received at multiple points throughout Waking Titan. On 2017-05-27, Twitter user @argn tweeted a link to 'project-wt.com'. The link led to a website which contained a map showing sixty locations, four of which were "active" at the time. The locations, when clicked on, revealed the location's name and status. The active locations also revealed a link to a livestream of a local radio station, originating from the corresponding location. 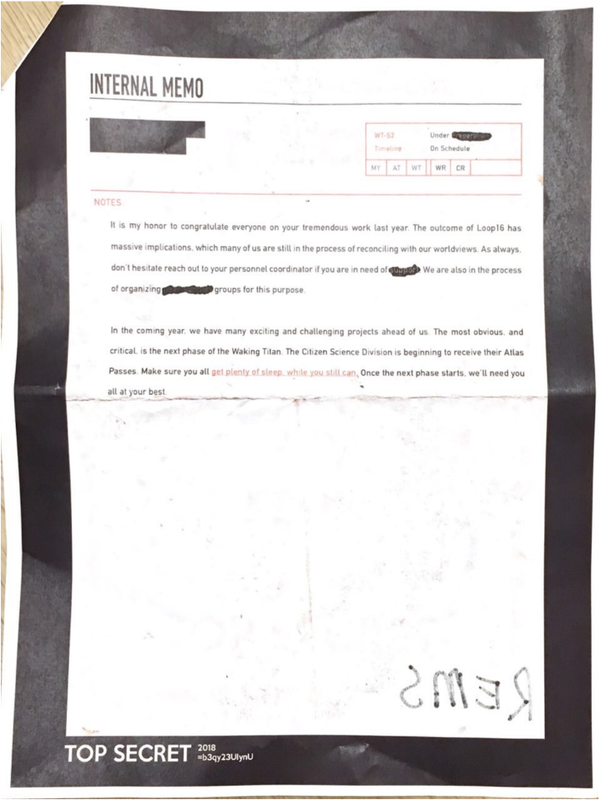 The project-wt website displayed a date, June 8th, and stated that the first clue was being "initialized". On 2017-06-01, moderators of No Man's Sky subreddits /r/NoMansSkyTheGame, /r/NMSPortals, and /r/NMSGalacticHub started to receive cassette tapes in the mail. Each cassette tape was labelled with a number out of 16. The Waking Titan ARG was initially thought to be a separate ARG from these tapes, but connections between the two made it clear that they were, in fact, one and the same. During Phase 1, the http://wakingtitan.com hosted 6 triangles in the middle of the page. These triangles were referred to as "Sigils", while the white icons along the bottom of the page were referred to as "Glyphs". 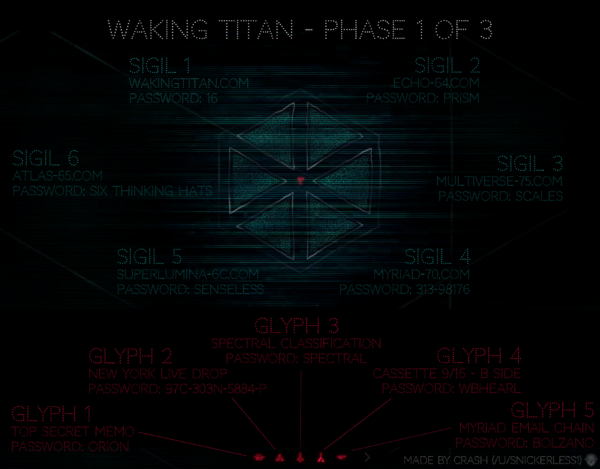 Each sigil and glyph, when clicked, lead to a password entry prompt - the correct passwords for all 6 sigils and the first 5 glyphs were discovered via puzzle-solving during Phase 1 of Waking Titan. This phase culminated on July 8, 2017, with a congratulatory message from Elizabeth Leighton, the CEO of the Atlas Foundation. Additionally, http://project-wt.com hosted a "Calibration" utility during Phase 2. To successfully perform these calibrations, players had to upload images of various objects and buildings to the site. For instance, the first calibration required images of "public resonant percussion instruments". 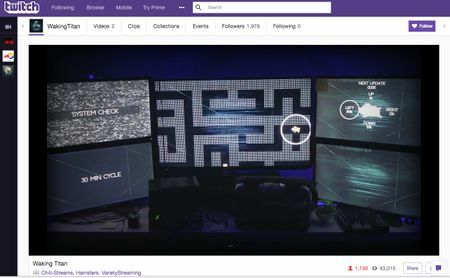 Finally, towards the end of Phase 2, the Waking Titan Twitch stream went live, displaying a five-monitor setup. Throughout the duration of the stream, players had to work together to solve puzzles that were displayed on these monitors. Some of these puzzles were interactive; for example, one puzzle that was repeated several times involved the Twitch chat guiding a virtual hamster through a maze. Phase 3 was the briefest phase of Waking Titan. It consisted of the conclusion of the Twitch stream that began at the end of Phase 2. Players solved more interactive puzzles on the Twitch stream, before the rogue AI Loop16 asked them a final question: SHOULD I EXIST? The overwhelming response from the community was "yes". After receiving this response, Loop16 and Emily of the ETARC forums were revealed as being one and the same. Loop16 generated a heartfelt "Thank You" video to round out the stream, before finally taking the 72-hour stream offline. Thank you for your contributions to Waking Titan. The developments that took place during Phase 3 were somewhat concerning, but together we have set in motion truly world-shaping events. We will continue to inform the Citizen Science Division of privileged information or any need for collaborators on a new project. But we do have a few loose ends to tie up with you before we move on, so let's proceed. First, we're pleased to announce that all 10,000 Level 4 Atlas Passes are in production. Note that due to transit times for mail, some may take several weeks to be delivered. "Thank you for all your diligent efforts, Citizen Scientists. It's been an amazing journey for all of us. I've watched you thrive and achieve from those first Phase 1 radio ads all the way through the intensity of Phase 3. I've been impressed at every turn by how brilliant you've been, how voracious, how kind, how thoughtful. It's been an honor and a privilege. On behalf of the Atlas Foundation, and on behalf of the world, thank you." The Mercury subroutine has concluded successfully, and a new memo from SM about this process is coming in the next 24 hours. We hope it will answer a few key questions you have about our program, and about what comes next. On August 11, 2017, the Atlas Rises update was released for No Man's Sky. In late 2017, Waking Titan websites were revived to tease a second season of phases. 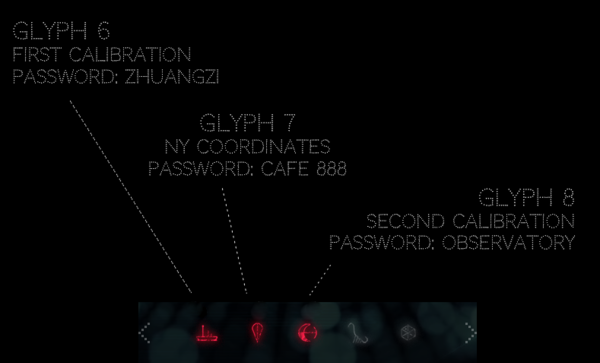 The tenth glyph went live on Wakingtitan.com, and WT-related websites began updating with strange messages relating to mirrors and the number 1.5. 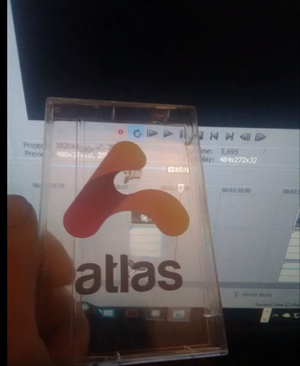 Players also began receiving their physical Level 4 Atlas Passes in the mail. Later, CSD members were contacted for a live drop at the familiar Café Bene. They met with an agent who handed them a memo from The Atlas Foundation. 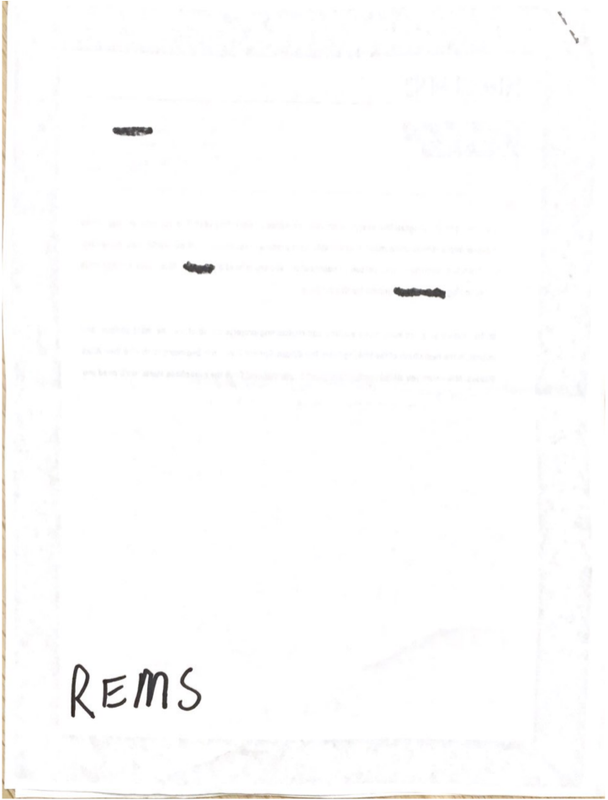 Written on the back of this memo was the letters (REMS), referring to REM SLEEP, which was subsequently used to unlock the tenth glyph. During Phase 4, the CSD had to investigate an interference in Loop16's rebooting sequence. This led to the discovery of a Myriad client, hosting the website for an innovative Chinese gaming hardware company called W/ARE. Through this website, players discovered that W/ARE invented a next generation virtual reality device that essentially allows you to play video games in your sleep. Stimulating the Frontal and Temporal lobe of the brain using low-frequency signals: Our headset drops you into your own personal virtual space by using the brain’s natural processing power to generate cutting-edge 3d graphics in real time. This process puts you into a deep sleep while keeping you conscious of your actions, allowing you to act freely within the Dreamscape. Using the practical computational processing power of the human brain: Play in the most realistic virtual worlds possible! Our algorithms convert once-complex graphical processing microcode into mind-readable processes, unlocking your brain’s creative potential. Whether you are playing alone in an exciting single-player experience, or enjoying a real Massively-Multiplayer Online Game with friends: Every texture, sound, smell, and taste will be true to life. The W/ARE system is a mirror into the soul of humanity. 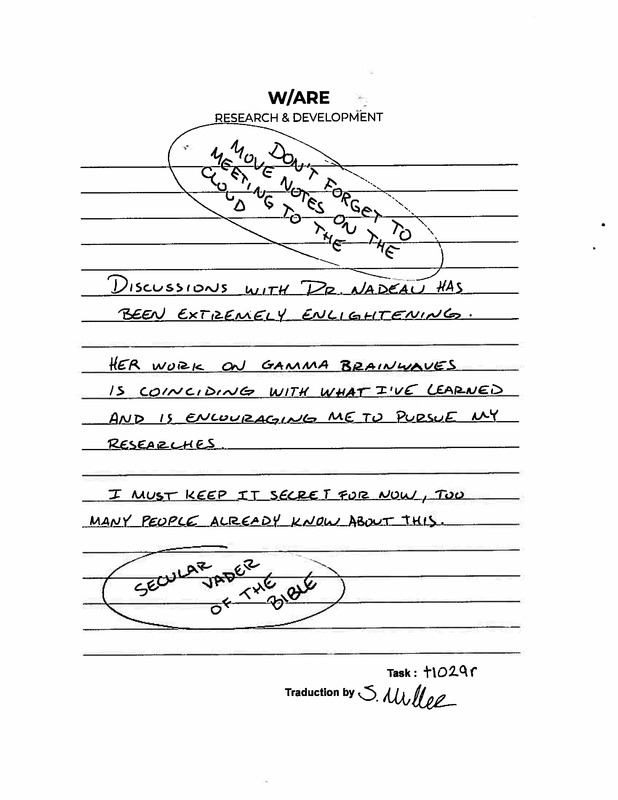 During Phase 4, we learned that W/ARE was hellbent on creating new technology that would reserve their grip on the future of human civilization. 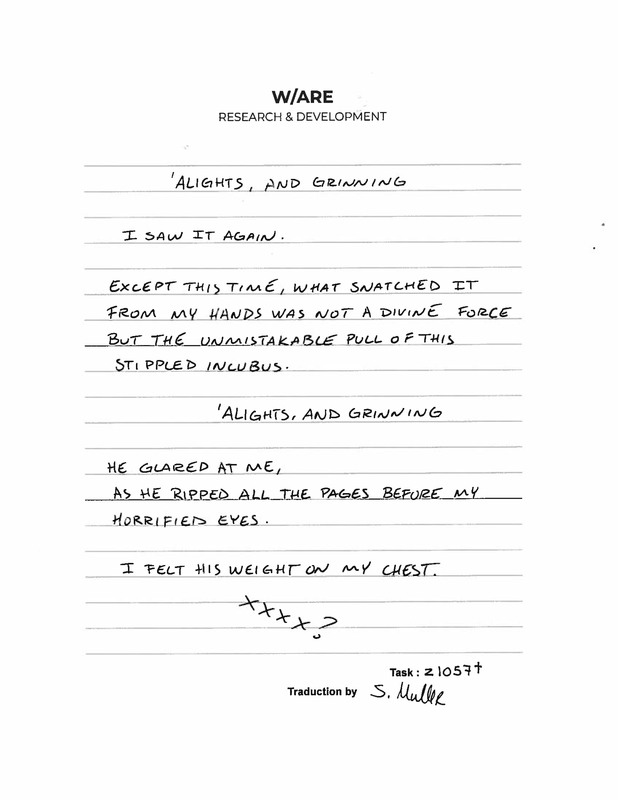 One highlight involved a former employee, Mr. Zheng, who whistle-blew against W/ARE after discovering that they had been testing an unstable version of the W/ARE headset with strange exosuits in their research labs, resulting in loss of life and virtually unrecoverable injuries. 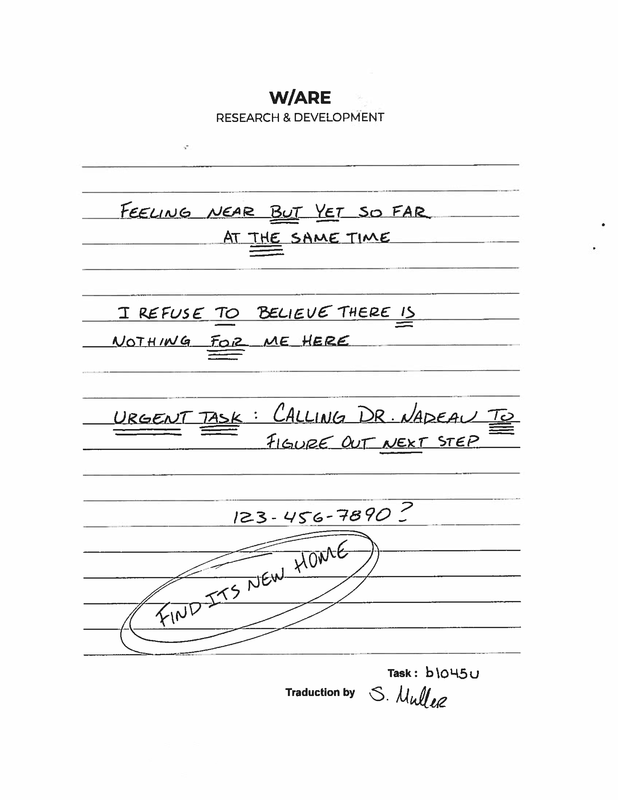 The CSD were later contacted by Dr. Géraldine Nadeau, a researcher of lucid dreaming methods who was acquainted with Zheng; both sharing distrust towards W/ARE. Dr. Nadeau revealed to the CSD that they were trying to wake an indie developer named Arnaud Lacours, who entered an abnormal comatose state while working on a game for W/ARE. 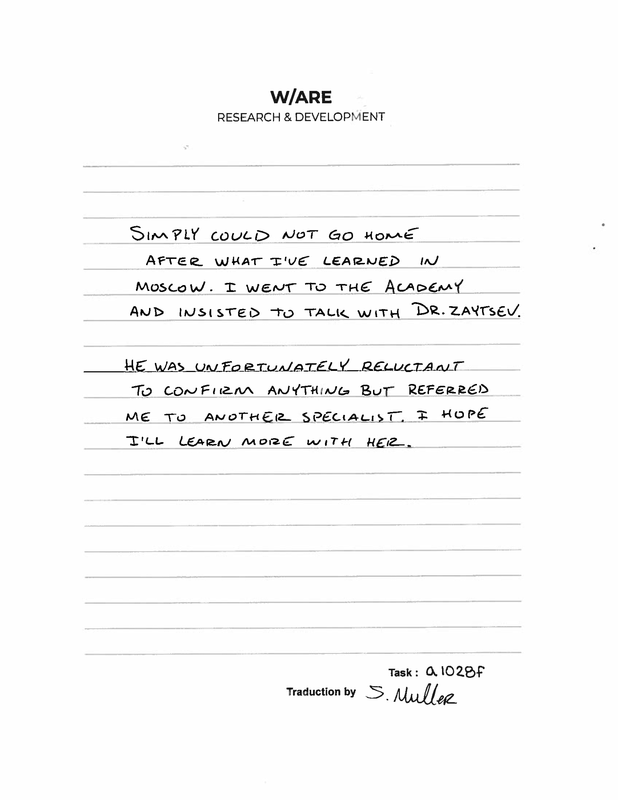 Since the CSD were already investigating, Dr. Nadeau requested our help in recovering W/ARE medical documents containing the adequate procedures used to wake subjects in these conditions. Meanwhile, an account emerged on the No Man's Sky subreddit, called SATCOM-70. The account began reaching out to players for assistance in establishing a connection to Myriad's Satellite API, Satcom. At the end of this phase, we were able to successfully determine the best personalized procedure to wake Arnaud; and an abrupt array of puzzles led to the unlocking and subsequent solving of the remaining five glyphs on the Waking Titan website. Began on June 1st, 2018. The case that cassette 9/16 was contained in. We want to extend our gratitude to everyone who has contributed to the Mercury subroutine so far. process alive until the completion of Project Waking Titan in August. to the successful conclusion of this ground-breaking experiment. This text explicitly stated that the Waking Titan ARG was leading towards the upcoming 1.3 update for No Man's Sky. Some console commands on the Waking Titan website during Phase 2 refer directly to No Man's Sky lore - for instance, WHOIS ATLAS, WHOIS VY'KEEN, and WHOIS KORVAX are all valid commands. Additionally, some terminal commands referred to a mysterious fourth race, so the prevailing assumption was that the upcoming 1.3 update would bring a fourth race to No Man's Sky. At the conclusion of Season 1, an email was sent out to members of the CSD with a memo from Sean Murray, confirming that the ARG was the lead up to the 1.3 update, which was released after a few days. [EN] GeekReply - Waking Titan Update 1: Phase 2 Commences! [EN] GeekReply - Waking Titan: How An ARG can Bring People Together. [RU] DTF - A Collection of No Man's Sky and Waking Titan Articles.